Patient falls are one of the most common dangers in healthcare environments. Reduce the risk of obesity related injuries due to inadequate handrail support with the Bariatric Handrail. According to the Facility Guidelines Institute (FGI) 2010 Guidelines, facilities must now design for patients ranging in weight from 350lbs up to 1,000lbs. Evidence Based Design advocates also call for all handrails from the bed to the bathroom to be rated to 1,000lbs in an effort to reduce slip-fall risks in patient rooms. Patient falls are one of the most common dangers in healthcare environments. Reduce the risk of slip-fall injuries due to inadequate handrail support. 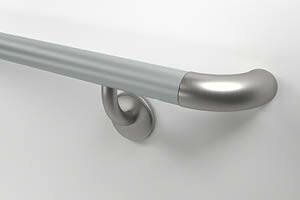 Our Bariatric Handrails support weights up to 1,000lbs when installed per manufacturer’s guidelines.